In digital marketing, cannibalization occurs when a paid search ad “steals” traffic away from an organic listing. You’ll typically find questions associated to this topic like, why should I bid on my brand name keywords? Or, why should bid on keywords that I rank #1 for organically? Let’s put these questions to rest once and for all because, in my opinion, cannibalization is a pretty harsh term to associate with paid search. So, unlike my Pac-Man example above, I prefer to view the relationship between PPC and SEO as a symbiotic one where both channels work together to achieve an overarching marketing goal. Let’s look at a few examples and discuss why it’s beneficial to appear in both spaces simultaneously. Real estate consumed on the search engine results page is the most easily seen benefit of targeting identical keywords in both paid search and search engine optimization efforts. Increasing the shear visibility of your brand is always beneficial; your (1) more noticeable and (2) consumers will begin to associate your brand more often with a particular search phrase – both branded and non-branded. 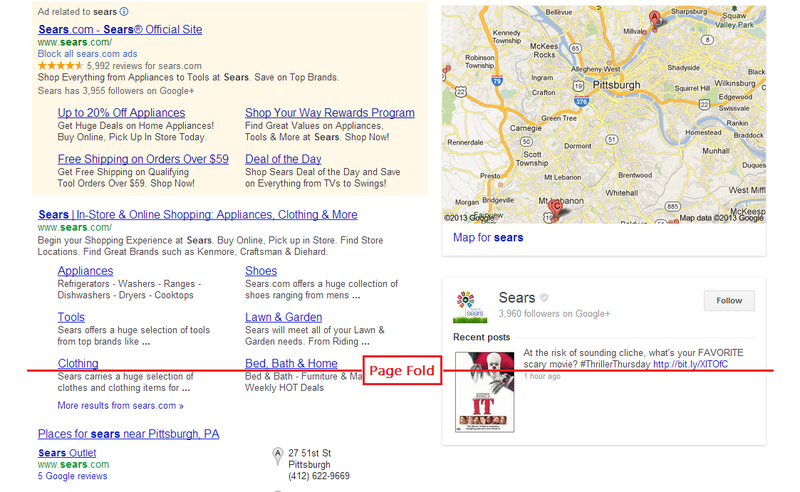 I’ve conducted a search for the keyword sears in the example below. I am not only served an organic link (with sitelinks), a map displaying locations, and a Google+ page, but I’m also provided with a paid search ad that consumes a huge portion of the SERP. In fact, the only brand visible above the page fold is Sears®. 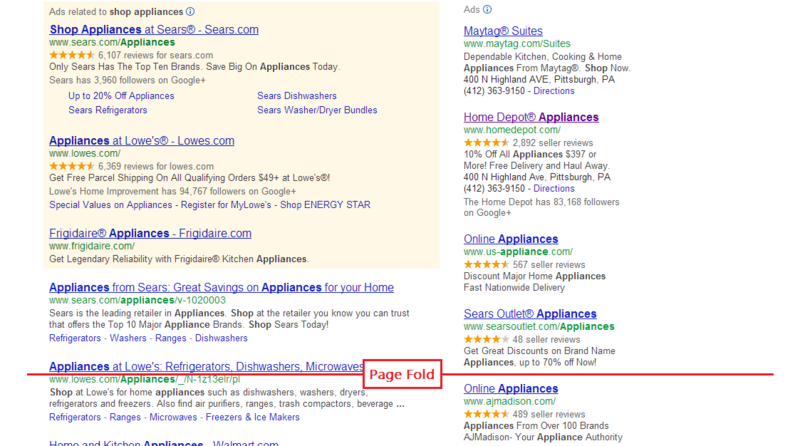 This advertisers has certainly done their homework in both SEO and PPC. Because the advertiser is dominating the SERP, they now have the ability to generate over a dozen different messages and ways (links) for the consumer to interact with their brand. But how do they leverage this visibility? Notice how the messaging differs between PPC and SEO, and think about how both PPC and SEO work separately. SEO is a long-term strategy, and PPC is a short-term strategy. We see similar techniques at play here in the non-branded PPC example: ad extensions, calls-to-action, etc. are used to build upon and solidify the message presented in long-term SEO strategy. The third benefit of targeting the same keywords in both SEO and PPC channels again harkens back to consuming real estate on the SERP. It is plain and simple; with more links pointing to your website at any given moment there is more opportunity for increased visitors. In Scenario 1, paid search ads are not running. Organic links are responsible for 1,000 website visits. In Scenario 2, paid search ads are running. Although organic visits have decreased due to the incorporation of paid per click ads, total website visits have actually increased to 1,250. So that’s 250 visits (1,250 minus 1,000) that you would not have received without the use of PPC advertising. Since SEO and PPC strategies essentially share the same goal of increasing your overall website traffic, you should certainly consider using both strategies in conjunction with one another to achieve your marketing goals. Both digital marketing strategies are tools used to achieve your marketing goals. Learn how you can use one to strengthen the other, forming a symbiotic relationship. Once this is achieved you can start to dominate the SERP and dominate your competition. Have fun! Questions? Comments? Leave it in the section below.